With over 20 years in the business, Vincent Allen and his team of professionals are continuously raising the standards of quality and value when it comes to washing and detailing cars. We believe success comes from our strong commitment to serving the community, fostering local business, and protecting our natural resources. We are a family owned business and we pride ourselves on providing professional car wash and detailing services to every customer we serve. 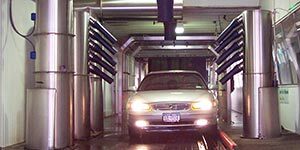 We are a Downtown car wash located at 358 Lake Ave. in Rochester NY…This location has been washing Rochester’s cars for over 50 years ! At Evergreen Car Wash we only use what we consider to be the best soaps and products on the market today for the professional car wash. Unlike any other car wash in the Rochester ny area, we apply 2 soaps to your car to ensure that your vehicle is gently and efficiently cleaned every time. We pride ourselves in the commitment we make to you and your vehicle. 1st Soap – Designed to clean and shine the exterior glass and chrome. 2nd Soap– Designed to gently break down and remove the toughest road soil and environmental pollutants from the painted surfaces of the vehicle. Tire Cleaner – Cleans whitewall tires to a new white look. Red Polish Wax – Specially formulated polish scientifically designed for today’s delicate automotive finishes. This polish will help protect the finish from the harsh environment, keeping your car’s finish looking showroom new. Under-Car Rust Inhibitor – Superior protection that has been proven in laboratory tests to protect the undercarriage of your vehicle from rust forming.